For centuries, mystical creatures of all description were gathered to a hidden refuge called Fablehaven to prevent their extinction. The sanctuary survives today as one of the last strongholds of true magic in a cynical world. Enchanting? Absolutely. Exciting? You bet. Safe? Well, actually, quite the opposite... Kendra and her brother Seth have no idea their grandfather is the current caretaker of Fablehaven. 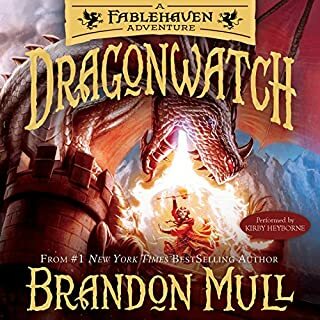 Fablehaven deserves a better narrator! Jason Walker has often wished his life could be a bit less predictable--until a routine day at the zoo ends with Jason suddenly transporting from the hippo tank to a place unlike anything he's ever seen. In the past, the people of Lyrian welcmoed visitors from the Beyond, but attitudes have changed since the wizard emperor Maldor rose to power. The brave resistors who opposed the emperor have been bought off or broken, leaving a realm where fear and suspicion prevail. 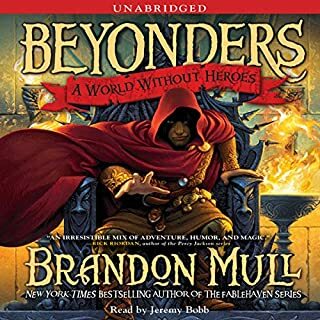 Brandon Mull has won me over again! Cole Randolph was just trying to have a fun time with his friends on Halloween (and maybe get to know Jenna Hunt a little better). But when a spooky haunted house turns out to be a portal to something much creepier, Cole finds himself on an adventure on a whole different level. A little scary at first, but a great story! Welcome to the Sweet Tooth Ice Cream & Candy Shoppe, where the confections are a bit on the... unusual side. Rock candy that makes you weightless. Jawbreakers that make you unbreakable. Chocolate balls that make you a master of disguise. 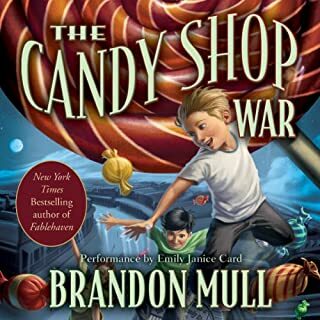 Four young friends - Nate, Summer, Trevor, and Pigeon - meet the grandmotherly Mrs. White, owner of the Sweet Tooth, and soon learn about the magical side effects of her candies. Do you have the courage, the wits, and the skill to claim a dragon's hoard? If so, apply within . . . The sign is small, tucked into the corner of Mr. Clutter's bookshop window: “Adventurers Wanted. Apply Within.” No one but fifteen-year-old Alex Taylor even seems to notice it is there. And for Alex, who has wished for a change in his life, it is an irresistible invitation.Upon entering Mr. Clutter's shop, Alex is swept away on an incredible adventure to a faraway land filled with heroic warriors, mysterious elves, and hard-working dwarves. Even though ­thirteen-­year-­old Marcus Kanenas is confined to a wheelchair, he sees himself as a survivor and a dreamer. In fact, his favorite dream is of a world far away, a world where magic is as common as air, where animals tell jokes, and where trees beg people to pick their fruit. He even has a name for this place - Farworld. 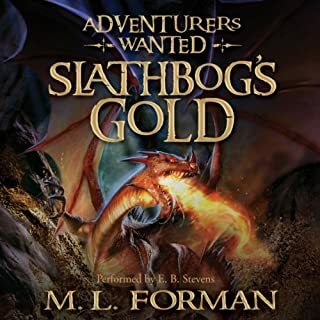 When Marcus magically travels to Farworld, he meets Kyja, a girl without magic in a world where spells, charms, and potions are everywhere, and Master Therapass, a master wizard who has kept a secret hidden for 13 years, a secret that could change the fate of two ­worlds. Fourteen-year-old Leven Thumps (a.k.a. "Lev") is no ordinary boy, but that's exactly what Sabine and his dark shadows want him to believe. They know the fate of the world and the dreams of all mankind can be saved by one boy with a powerful gift, one he has yet to understand or control. Enter Clover, a funny foot-high sidekick; Winter, a girl who can freeze things; and Geth, the rightful heir to the dream world of Foo. Three transplants with only one mission: to retrieve Leven and save Foo. Jake is a scrappy orphaned pickpocket living by his wits on the streets of Victorian London. Lately he's started seeing ghosts, and discovers he can move solid objects with his mind! He has no idea why. Next thing he knows, a Sinister Gentleman and his minions come hunting him. On the run for his life, Jake is plunged headlong into a mysterious world full of magic and deadly peril. A world that holds the secret to who he really is: the long-lost heir of an aristocratic family - with magical powers! When 15-year-old Beck Phillips travels by train to the secluded village of Kingsplot to live with his wealthy but estranged uncle, Beck discovers some dark family secrets. A buried basement, a forbidden wall, an old book of family history with odd references to...dragons? Beck's life is about to be changed forever in this suspenseful tale about the destructive nature of greed and the courage to make things right. Trenton Colman is exceptionally creative, with a knack for all things mechanical. But his talents are viewed with suspicion in Cove, a steam-powered city built inside a mountain. In Cove, creativity is a crime, and invention is a curse word. Who is Septimus Heap? A lost child? An ordinary hero? A powerful wizard? The Magyk begins here. The first book in this enthralling new series by Angie Sage leads listeners on a fantastic journey filled with quirky characters and magykal charms, potions, and spells. Magyk is an original story of lost and rediscovered identities, rich with humor and heart. Long before they were spirit animals, the four were still legends - Great Beasts, the most powerful beings to roam the wilds of Erdas. Aided by a brave resistance of humans and animals, they gave their lives to protect the world from a threat more dangerous than any it had seen before: their own kind. Wise and cunning, gentle and ruthless, these are tales of the true heroes and villains in the war that started it all. 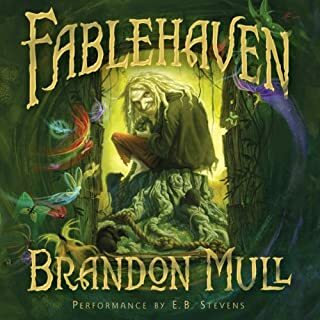 At the end of the school year, Kendra and her brother, Seth, find themselves racing back to Fablehaven, a refuge for mythical and magical creatures. Grandpa Sorenson, the caretaker, invites three specialists - a potion master, a magical relics collector, and a mystical creature trapper - to help protect the property from the Society of the Evening Star, an ancient organization determined to infiltrate the preserve and steal a hidden artifact of great power. Time is running out. The Evening Star is storming the gates. If the artifact falls into the wrong hands, it could mean the downfall of other preserves and possibly the world. Will Kendra learn to use her fairy gifts in time? Will Seth stay out of trouble? Can they overcome paralyzing fear? Find out in book 2 of this bestselling series. While these books are geared toward children, they are really a lot of fun for any age. I love the imagined world in these books. I like the fact that the kids make mistakes but learn from them. I really love seeing their thinking process and what their imaginations come up with for solutions to difficult problems. The added characters, magical potions, magical artifacts and creatures are really cool. 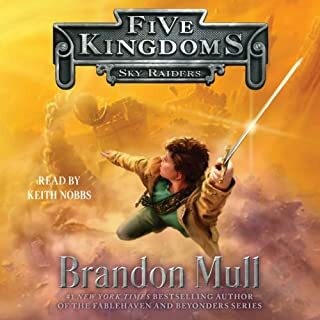 My 9 year old son has just listened to this audiobook. You can't believe how much work and summer-time math practice I got out of that boy, because I wouldn't let him have my ipod to listen to this book until he was done with school practice and chores. At the end he said in a frantic voice, "Mom! Where is the third book?!" Hooray that Audible has them on their site now! I'm going to get them all. I have them on CD already, but the CD versions are a NIGHTMARE to put into itunes. They misname files, misname the book, change the name of the narrator and the whole numbering sequence of the files. You honestly have to rename all of the hundreds of files to get it to play correctly on an ipod. We don't have many CD players left. I'm one of the people who has begged Audible to get these books because the CD's are truly atrocious. Only one problem..... where are books 4 & 5? Hopefully, they get them soon. Warning: The narrator has a strange cadence, but you get used to it. It is the same narrator as for the first book, so if you liked that you're fine. Listen to the sample before you buy. He drives me nuts sometimes, but somehow you forget about it when the story picks up. He does old and young voices well and they use some cool special effects for monsters and other voices. I especially like his voices for the main characters. Seth and Kendra are spot on. I'm listening to them all again at the same time as my son. The third book is one of my favorites, and I can hardly wait to listen to it. If you love clean fantasy adventures in a truly magical world, great main characters and an interesting storyline. 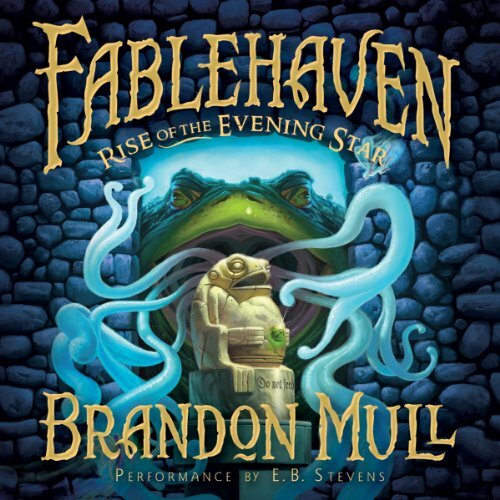 You'll not miss the mark with Fablehaven 02 Rise of the Evening Star. Just as good or better than Fablehaven. Great books for the 8 to 14 set that adults will also enjoy. Great for LONG car rides and family fun! Some scary moments. No bad language or compromising situations. All around good fun. I am an adult and my wife got this to a road trip with the kids. I honestly have been finishing up what I missed at work. It is a great story. Highly recommend it for all ages. couldn't stop listening. well done! I'll be straying book three shortly. I'm glad I chose this series to start my audible journey. I'm hooked. If you liked book one then I highly recommend continuing with this series. I can't wait to start the next book! Absolutly loved it!!! A strong magical adventure!! Fun unique characters!! Dark challanges, breathtaking to overcome!!! Genuine EXCITEMENT!!!!!!!!! very well written and performed!! this was an amazing continuance to a great series that I will continue reading til the end!! I wish I could return this book. The reading is so over the top and distracting I had to turn it off. On one hand I recognize that this is a young adult book, but on the other, it's not meant for 2yr olds. I'm very disappointed. LOVED it SO SO SO Much!!!!!!!!!! I didn't want to finish it! That's how good it was. FABLEHEAVEN is the best sieres I've ever read!